Duncan is a 15 year old large mixed breed dog who has been on medication for his arthritis. His owners contacted me to try acupuncture on him so they could decrease the dosage of his medication because they did not like it’s side effects. On physical examination, Duncan had a shortened gait, moderate limp on his right front limb, and thickened bilateral elbow joints. Myofasical palpation revealed tight triceps and gluteal muscles, and pain in his thoracolumbar spine area. Traditional acupuncture along with electroacupuncture was performed once a week for a total of three treatments. Duncan became more sensitive to the acupuncture with more treatments, and began to cry out and dislike being needled. He was very sensitive to needling of his right triceps and elbow, so I was never able to perform good treatment for those sites. Clients saw minimal improvement with treatment. They were pleased with some of the effects on his body, but the limp was still pronounced. Because of his sensitivity to needles, I recommended they take him to a practice with a therapeutic laser to try and see if that modality might be better suited to treat Duncan. 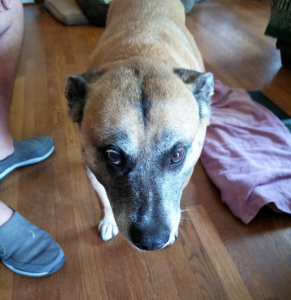 Duncan is a 15 year old, 73 pound, male neutered mixed breed dog. His owners are previous equine clients of mine who contacted me for help. Their regular veterinarian has diagnosed him with arthritis and they have been managing it with tramadol, gabapentin, and carprofen. The clients do not like how Duncan reacts to the medication. He is sleepy, lethargic, and not his normal happy self. Their veterinarian recommended they try acupuncture to see if it would help them decrease the medication dosage. Duncan has a history of bilateral TPLO surgery to correct cranial cruciate ligament rupture a few years ago. Radiographs of his right elbow performed by his primary veterinarian demonstrated moderate to severe arthritis in that joint. Otherwise, Duncan is a healthy senior pet without any history of serious illness or injury. 1. Physical Examination: On initial examination, Duncan was bright, alert and responsive. TPR and other physical exam findings were within normal limits. BCS: 6.5/9. Clients are aware that Duncan is overweight and have him on a diet. His neck had good range of motion. Decreased range of motion bilateral stifles and elbows. Elbows both thickened. At the walk his gait is stiff in all four limbs, more in the front than in the hind, and he has a moderate limp in his right front limb. 2. Myofascial Palpation: Myofascial palpation revealed extremely tight tricep muscles bilaterally, worse on the right than on the left, with multiple trigger points. He also had tight gluteal muscles. There was moderate pain to palpation over the thoracolumbar spine. Brief neurologic examination revealed no abnormalities. This case was referred to me with the diagnosis of right elbow and bilateral stifle arthritis. On myofascial examination, I was able to diagnose compensatory tricep and thoracolumbar spinal muscle soreness from trying to transfer weight off of his painful joints. Acupuncture has been used for treatment of chronic pain conditions, such as arthritis, for a long time. In a study by Jin Hwan Oh et. al., weight-bearing forces were significantly improved and afferent nerves less stimulated after acupuncture in rats with medically induced arthritis. In arthritic mice, acupuncture point ST-36 has specifically been shown in a study by Yim et. al. to reduce inflammatory mediators such as IL-6 and TNF-alpha. My plan, therefore, was to use acupuncture to neuromodulate the nerves associated with his arthritic joints. Nerves to be treated would include the fibular nerve for stifle pain, sciatic nerve for hip pain, and radial and ulnar nerves for elbow pain. Spinal nerves would be neuromodulated and trigger points in the epaxial muscles deactivated to aid in back pain reduction. Neuromodulation of these nerves would lead to reduced transmission of pain from affected joints. In his first acupuncture session, I primarily wanted to see how Duncan would react to the needles and decrease the muscular/body pain associated with him guarding himself from his right elbow and bilateral stifles. In the second and third acupuncture sessions I added points to specifically target his right elbow joint, stifle joints and hip joints. I used acupuncture points GV20, GV14, Bai Hui, and ST36 (left side) for their central, calming effects in all three sessions. I stimulated acupuncture points BL 15, 18, 21, 23 and 25 bilaterally with electroacupuncture (mixed mode at 2Hz and 100Hz) in all three sessions. I added ST34 for stifle pain and treated the right elbow with LI10 and HT3. At the second session, I added a bilateral hip triad and performed e-stim on the right elbow between LI10 and SI11. During the second session, I attempted to deactivate a trigger point in the triceps, but he cried out in pain and snapped, so I used massage instead to try and release the muscle tension. In the third session, I saw some improvement in his myofascial palpation through his back, but Duncan continued to have a significant limp. When I needled him, he was much more sensitive and cried out when I tried putting needles into triceps and shoulder muscles on the right side. I used 25mm x 0.20mm Carbo needles for all central/bladder line points and the hip triad, and 15mm x 0.16mm Serin needles for points on the distal limb unless electroacupuncture was being applied, in which case I used Serin 30mm x 0.23mm needles. I used Hwato 25mm x 0.23mm needles for GV20. Unfortunately, traditional acupuncture alone was not effective in this case. I had told the clients that it can take at least three sessions to show improvement, but we were seeing Duncan get progressively more sensitive and less tolerant of treatment with time so we elected to stop treatment with him. The clients did let me know they felt they saw improvement in other parts of his body, like in the pain through his back, but his limp was persistent throughout treatment. A study by Kapatkin et. al. found that acupuncture did not significantly improve lameness in dogs with elbow arthritis, as measured by ground forces and pain score. Similarly, a review by Janssens found that arthritic hips, knees, and shoulders responded better than other joints treated. This case, although not successful, was a valuable learning experience. It showed me that traditional acupuncture does not work for every dog. In Duncan’s case, his muscles were so tense and painful that he did not tolerate needling well and it was difficult to perform treatment. It also demonstrated to me that other modalities, such as therapeutic laser, can be implemented and that it might be a good thing for my practice to pursue in the future. I believe I need to implement more distraction techniques in my acupuncture sessions, such as baby food, to try and make it more enjoyable for the patient. I think it is important to temper my expectations and the expectations of the client. Acupuncture can be effective, but sometimes a dog has arthritis that is advanced to where it may not be improved by acupuncture alone. JANSSENS, L. A. A. “Observations on Acupuncture Therapy of Chronic Osteoarthritis in Dogs: a Review of Sixty‐One Cases.” Journal of Small Animal Practice, Blackwell Publishing Ltd, 10 Apr. 2008, onlinelibrary.wiley.com/doi/10.1111/j.1748-5827.1986.tb02247.x/abstract. Kapatkin, Amy S., et al. 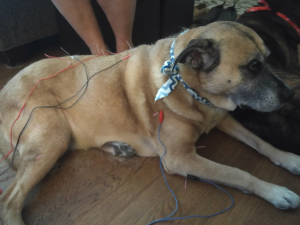 “Effects of Electrostimulated Acupuncture on Ground Reaction Forces and Pain Scores in Dogs with Chronic Elbow Joint Arthritis.” Journal of the American Veterinary Medical Association, vol. 228, no. 9, 2006, pp. 1350–1354. Oh, Jin Hwan, et al. “Pain-Relieving Effects Of Acupuncture And Electroacupuncture In An Animal Model Of Arthritic Pain.” International Journal of Neuroscience, vol. 116, no. 10, 2006, pp. 1139–1156.